Virat is at the top of the celebrity league today, far ahead of the Khans or any other superstar. He lends tremendous velocity and stature to the couple brand where Anushka is an equal partner, says Sandeep Goyal. In the age of acronyms, they are an MFEO (Made-For-Each-Other) couple. Virat and Anushka. 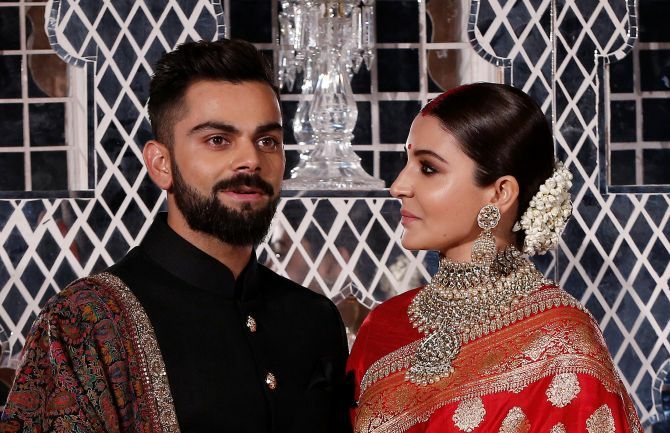 The media hype in India for the Virat Kohli-Anushka Sharma wedding was right up there, competing with the likes of Lady Di and Prince Charles, and Kate Middleton and Prince William. In the world of the celebrity-crazed fan, they are nothing short of royalty. And for brands the couple spells gold, in terms of their mass and aspirational appeal. Not since Aishwarya Rai and Abhishek Bachchan tied the knot, has there been so much excitement about a wedding in India. But the Virat+Anushka (Virushka) union has wider appeal: the combination of cricket and Bollywood is far more potent, and lethal (a throwback to the marriage between Nawab of Pataudi, also Indian cricket captain and 1970’s heart-throb Sharmila Tagore). But that was a long time ago and both Pataudi and Sharmila were in the evening of their respective careers when they wed. Virushka are current, and in their prime. India has never had a visible, viable and tenable ‘couple brand’ to compare with, for example, David Beckham and Posh Spice in the UK. Shahrukh and Gauri Khan have done a few commercials together. So have Akshay and Twinkle. But their brand impact is not as substantial. Or memorable. Virushka is a marketers’ delight, the couple opens up opportunities to sell ‘togetherness’, ‘love’, ‘happiness’, ‘warmth’. Beauty, apparel, jewellery, insurance, lifestyle, watches, mobiles, ‘luxury’ holidays, homes, airlines, cars, life and hope--the couple can be used across the categories and creative concepts. The recent Manyavar-Mohey ad that released just before the famous nuptials shows us just how brand-able the couple is. My work on human brands (as part of my doctoral studies) over the past five years extensively covers ‘couple brands’. And I almost gave up when Virat and Anushka nearly broke up a couple of years ago. I had already had to delete Ranbir-Katrina from my list when they parted. Ranveer-Deepika were not together when I first seeded the research. Akshay-Twinkle and Shahrukh-Gauri never made the cut. The female partners were just not universally well-known enough. Fortunately the relationship survived and so did my research. Besides Virushka, the other couples in my study are Abhishek-Aishwarya and Saif-Kareena (Saifeena). Brand Virushka dwarfs the others by a mile. Virat is at the top of the celebrity league today, far ahead of the Khans or any other superstar. He lends tremendous velocity and stature to the couple brand where Anushka is an equal partner. In contrast Abhishek and Aishwarya are almost absent from the big screen now. Theirs is a fading brand. Saif and Kareena have had a lukewarm response from brands too. They trail Virushka on almost every parameter and come out poor even in comparison to Abhi-Ash. The Virushka brand has momentum and, given the paucity of competition, will see significant interest from advertisers in the coming months. Virat Kohli’s brand value is estimated at a massive US $14.5 million. He is the juggernaut of the Indian endorsement business today. When they feature together, Virat will be the engine that will drive both success and commercial visibility for the couple brand. Brands will find in them a long term opportunity. They are wildly popular in their current avatars. Ideal brand ambassadors for multiple categories. If managed prudently, they can remain relevant for years to come.